I think you all know I'm crazy about my Arkansas Razorbacks! My parents both went to the U of A and we have been coming to games as long as I can remember. I thought I would share some of my favorite recent pictures and memories (even though I have a lifetime of these). In 2006 - College Game Day came to Fayetteville for the first time when AR and TN were both ranked. We got up early and came and watched the show and then we BEAT the vols that night. We were not quite "#1" but that night it felt like it! One of our favorite game day experiences is when our families can come and be with us. Scott's parents usually come up for one game every year. They are coming this weekend for the Auburn game only just the men are going this time. My parents come for every game so it always gives us an excuse to see them. My dad also comes to most basketball games - he is a crazy fan. I love basketball SO MUCH too but my very favorite is Football. I can not stand baseball (sorry to all of you who love it). 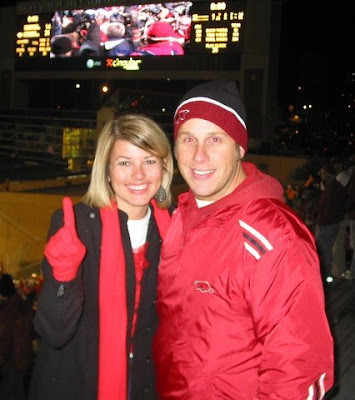 In September 2003 - Scott and I went to Austin with my family to watch the Hogs beat Texas. That was so fun but it was also the HOTTEST I have ever been in my life. It was an 11:00 kickoff and we were sitting in the direct sun. It's also the most sunburnt I've ever been. 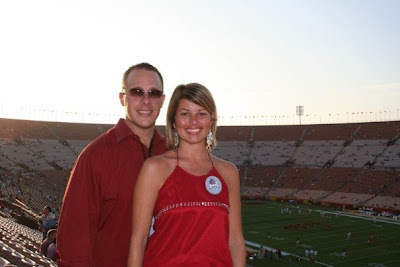 Scott and I went to Los Angeles to see Arkansas play USC in the coliseum a few years ago. It was such a fun trip. The game - not so much. I've tried to erase the score from my memory but I'm pretty sure it was like 77-14. yikes. 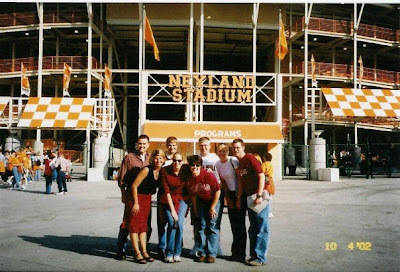 In 2002 I hitched along with a group of people going to watch the hogs play in Knoxville. I only knew a few of this group but I've always wanted to go to a game in Neylend Stadium so bad. I had a great time but once again we lost. In 6 overtimes. BRUTAL. The Tennessee people were SO nice - I would love to go there again. It's a dream of mine to visit all SEC stadiums at least once before I die. I really need to get moving on that. I have 10 more to go. I love this picture because it was Harper's FIRST Razorback game. I was about 5 months pregnant. This was also the first time I really felt Harper kick a lot - during the game. I guess all my screaming and jumping got her excited. ha! My friend Hillary is as crazy as I am about the hogs. In fact - we got season tickets the same year and out of almost 80,000 seats - we wound up right next to each other which to this day we still think is amazing. 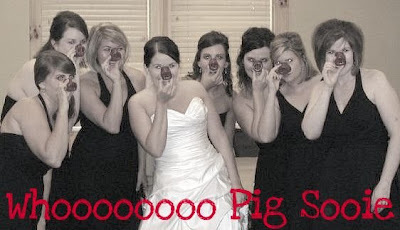 She got married last year and we all posed with Hog noses! How cute is that? I wish we would have done that at our wedding! And of course my favorite tradition now is dressing Harper up for game day. I can't wait until we can start taking her to games. It will probably be a few years but I hope she grows up loving college football and the hogs as much as I do. I'm pretty sure she has no choice. and then shake our fists and say "RAZORBACKS"
Our team also has the tradition of running out into an "A" formed by the band at every game! Hog fans love to tailgate as pretty much every school does. What you will probably find the most at each tailgate is Barbeque. We love BBQ in Arkansas. Which is ironic - if you think about the fact we are eating "pork". ha! Let's hear it for your teams! P.S. I HAVE TO END THIS WITH: GO HOGS BEAT AUBURN!!!!!!!!!!!!!!!!!!!!! I love your Razorback spirit! I was at that Arkansas @ USC game too! Too fun! Hope you had a good time despite the score! I always love all of your pictures! You look great in every. single. one.! Love the pics at the stadiums! in my kindest voice... I just have to say WAR EAGLE!!!! At Baylor if you're rooting for another team you say "Sic 'Em (insert team name here). Soooo....Sic 'Em Hogs! I LOVE that you added the "whoooo pig..." to the wedding photo. I'm a fan! Gonna miss you tomorrow! Dont you just love football season! And I'm gonna have to say WAR EAGLE! Let's go Tigers! You can't even tell you are 5 months preggo in that picture! You were so tiny!!! Love all the pics! And love college football!! Plus, I have a picture at the very end of post in honor of you and your Hogs!! WHy don't you take Harper to the games? We are also huge football fans and I have taken my 7 month old son to all of them! I am SO glad to see that you said the Tennessee fans were nice to you! As a Tennessee fan I have always hoped that we were good hosts! I know you have touched on this before, but it is so crazy how different people dress for games! I am a Big 12 girl (Rock Chalk Jayhawk) and would never even imagine wearing a dress to a game! But you look so cute - maybe I will go out a limb next time I make it to a game and dress up! If I didn't say it my husband would be very disappointed - WAR EAGLE! I am so glad you enjoyed your visit to Neyland and that everyone was nice. I firmly believe that Tennessee is very different from other schools. I truely envy the school spirit that everyone has in the south. I sure do miss you, hope to maybe see you next week! I will give you a call!! I can't believe you're five months pregnant in that picture! You look tiny. You might as well been talking about the Sooners in everything you said, because this is my life living in Norman! I even work on Campus Corner, so on gamedays, it's a SEA of crimson and cream. Love college football! Go Noles! I am still wowed by the sunburnt picture. Girl, you are TIIIIINNNY in that picture. Yikes! I've NEVER been that tiny. I bet you weighed like 110. First time commenting. I LOVE your blog! I had to set up an account so I could comment today! I Loved the Neyland Stadium pic! I live in Knoxville and I am a die hard Vols fan! Like another lady mentioned, my husband and kids don't understand my sudden interest in the Razorbacks this year, so I had to show them your blog! lol We also root for all SEC teams when they are playing other conferences...gosh, it's hard to root for the Gator's though! My son and brother are HUGE BAMA fan's. My son's room is all BAMA and actually looks pretty cool and my brother named his daughter Bama... we thought he was crazy at first, but it really suits her. Now, that I have an account, you will probably hearing more from me. Love reading about you and your precious Harper. 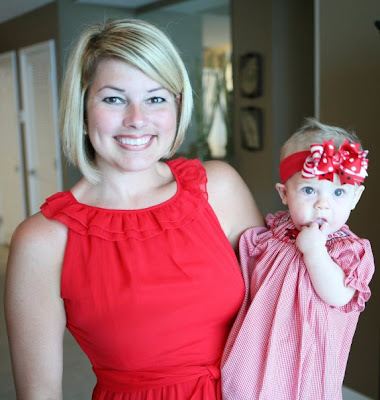 Kelly I love your blog and my daughter is not much older then Harper as Jayci will be a year old next week! I live in Auburn and I do have to say "War Eagle" and we are looking forward to a great game!! As a HUGE Alabama fan... I'll be helping you call those Hogs this weekend! Whooo Pig Sooie!!!!!! Okay, so I love this southern tradition of dressing up for games - I will bring that up north when I move back next year. That being said ... I think you should post a video ... of maybe you and Harper calling the hogs? I'm just saying ... I think it would be cute. I love reading your blog but WAR EAGLE!!!!! First time commenting, but I've been reading your blog forever and love it! I'm always torn this game. I'm originally from Arkansas, but went to school at Auburn! I will be outwardly pulling for Auburn, but there is always a part of me that loves those Hogs!! We're an SEC family too. My parents went to Kentucky, my husband loves Tennessee, and we met while in grad school at Vandy. There is a book out now, a memoir of a guy who went to all the SEC stadiums and writes about the traditions at each. I can't remember the name right now, but I bet you would love it! You always crack me up! I love the pic of the wedding party with the noses! How funny is that! You and Scott look like the cutest couple! I love Harper's custom outfits, I get Kelcee's made on Etsy! I have a quick question, the smocked dress of Harpers, where did you get that???? I would like to have one for Kelcee but with another team on it.... I know sorry about the whole other team thing! Ha! I can't let it pass....WAR EAGLE! :) It would be against my southern, Auburn Tiger, roots! This time I'm right there with you - I can't wait for you guys to beat Auburn. ROLL TIDE! I love your blog and think you are sweetheart, but I knew we would get to this week eventually. So War Eagle!!!!! Hope it's a good game, too bad I'll be working and miss it! We'll be helping you cheer on Arkansas this weekend! Go Razorbacks, beat Auburn!! I say this with all due respect... WAR EAGLE! Waaaaaaaaaaaaaaaar Eagle! Hey! Harper would look adorable in a little orange and blue cheerleader outfit, don't you think? I'm almost 6 months pregnant now and we took Lily Ann to her first Alabama game about a month ago. She was kicking up a storm, too! Babies must love the roar of the crowd and feel the excitement! Haha! You call the Hogs, I call the Dawgs! GOOOOOOOOOOOOOOOOO Dawgs! Sic 'me! Woof Woof Woof. I love seeing all the girls on here that get as excited about college football as I do. Do women up North get as geared up about football as women in the South? Love your blog. I am addicted. Just wanted to comment for the 1st time. With my first two kids we collected/bought every childrens dvd available. When my twins were born we would blame the broken/scratched/not useable dvd on on the babies. Just recently the babies (now 3) found my "stash" they were so excited about all the dvds they could watch. However all 200 of them don't work What was I thinking keeping them. Maybe the magic dvd fixer fairy would fix them. They have been crying all week to watch them What was I thinking??? I had good intentions, but something just never will be the same/used again. I think it will be funny/fun to watch all your readers reveal there guilty pleasures. Thanks you so much you your blog and god bless!!!! I am still working on setting up my blog so can't participate, but just wanted to give a shout-out to my Kentucky Wildcats~Go Big Blue! Of course, here in KY, our biggest passion is basketball--cannot wait for the season to begin! Oh, and if you think the TN fans were nice, Kelly, please come to Commonwealth Stadium or RUPP ARENA....we will truly show you what tradition and southern hospitality is all about!! I live in Tx, with the longhorns and the aggies. HA. 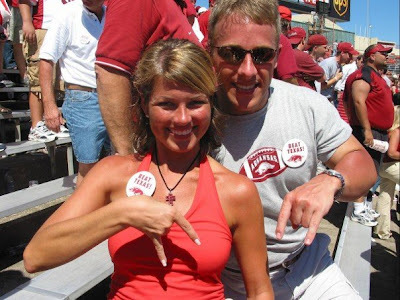 I cannot believe I am the only SOONER fan that reads Kelly's blog!?!? Let's show them some SOONER spirit! What a cute post, and fun tradition. We love college ball around our house too! GO HOGS!!! I totally think you should have posted a video of you calling the Hogs! 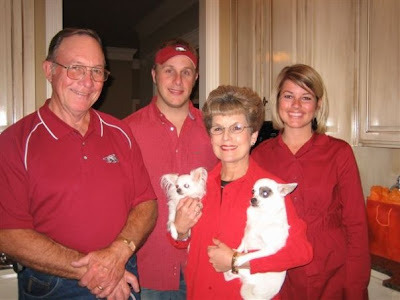 I will never forget after I moved here and married Todd, my sister and her husband came to visit, and we took them to a basketball game and when people started calling the Hogs they could not stop laughing! They had never seen anything like it! Have a great weekend, Kelly! 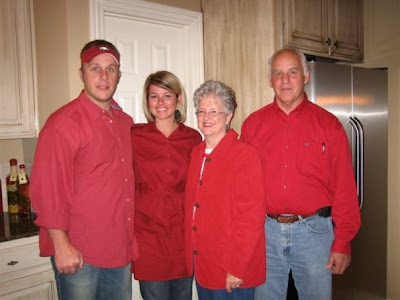 My best the Arkansas as long as Ryan Mallett is your quaterback. He started at Michigan (MY TEAM!!!!) and had a GREAT freshman year. We LOVED him, but then our coach retired and he transferred to Arkansas. Enjoy him. Go Michigan! Go Mallett! Hey Kelly! 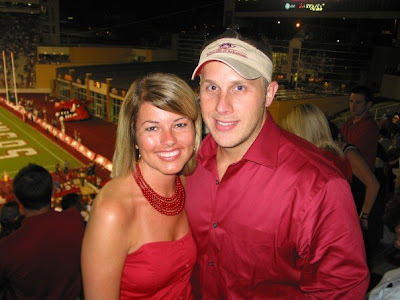 I went to U of A and was in the Razorback Marching Band and got to go to the Texas game in 2003 - you aren't kidding about the heat - and we were in those awful, heavy uniforms too! SO HOT, but so worth it! I was also at the TN game you went to! I got to see us beat Ole Miss in the 7 overtimes my freshmen year! GO HOGS! :) And do you remember Batman Carrol? One year in the BIG A, he ran by and slapped my rear and then turn around and winked at me and all the other girls were so jealous! :) Fun times! Love being a RAZORBACK!! I was being nice earlier, but since everybody else is having fun, I'll join in. I loved this post--your pictures are great! Ya'll are just too cute! Dillan was sitting on the coach next to me and we watched you call the hogs together...HE LOVED IT!...But don't tell Howie. :) He raised his arms and said "Wooooo" and then clapped his hands. Ha Ha! Growing up in Michigan...when I moved to AL in the 6th grade, everyone asked me am I a War Eagle fan or Roll Tide? I didn't even know what they were talking about! I quickly learned that in Alabama you have to make a choice! My son's favorite color is Orange...so don't hold it against me!! War Eagle!!! This is my first time commenting, but as a Vol fan I was so excited to see that you came to Neyland stadium! Good luck with the game tomorrow! Love your blog... but gotta give up a BIG Waaaaaaaaaaaaaaaaaaaarrrrrrrrr Eagle, Hey! That you for posting the video, I needed a visual. Here is in Ohio it is GO BUCKS! OH-IO! Can I just say: your bangs are adorable! I think you and Harper might just be the cutest football fans ever. Kelly, I went to Sonic and thought about you. :) I even wrote about ya in my blog tonight and how I got the cherry vanilla diet coke, which is my absolute favorite! Yummo! I so wish I had a Sonic closer to me. My husband and I are huge Clemson fans. So are our parents. Our son will not have choice about loving our Clemson Tiger, but I don't think that he will mind. I wish I had tailgating pictures. We go to almost every game, but I never bring my camera. It doesn't fit in my game day purse. :) I love having a big team to follow. PS. I love all of Harper's game day outfits! We can cheer for the Hogs too, since we never play them. I have been to many Razorback football and baseball games in the past. John Bland and his wife Candis are good friends of mine (he used to QB for them) and we used to make the rounds all the time. We visited the campus and found her name on the sidewalk--awesome tradition!! Good luck with the game tomorrow! I love your blog and read it every day. I have a daughter named Harper too, but I found your blog after she was born...promise I didn't steal the name. :-) Anyway, we love SEC football too and I'm so happy to be sharing it with both of my daughters. They both attended their first tailgate last weekend and LOVED the entire day. So much fun. I bet your Harper will just love all of the people, sights, and fun when you do decide to take her! My link is #139. Good times! We are big MLB fans (sorry, I know you're not) and love having a team to follow and cheer for! Enjoy your blog daily - this is my first official comment! Precious video of you and Harper!! Thanks for sharing. LOVE the video! You are Harper are SOO cute :) Have a great weekend! I LOVE that you made that video. I actually didn't get the whole Pig Sooie cheer so that helps! Thanks for being so down to earth. I hope your team wins! You are so funny! Love the demo at the end! You are so cute in all of those pictures! Love the new bangs! Question- what is tailgating? Because here in Australia it's when you drive too close to the car in front of you... and I'm guessing by the context of what you were saying that that's NOT what you were talking about! Ha! LOVED the video of you 2 calling the hogs!! I miss living there and doing that!! I love it!! Have a great weekend!! War Eagle!!! We made the LOOOOONNNNGGG drive up to Fayetteville in 1999 and Auburn lost a rainy game again your Hogs....what I remember most about that trip (besides Eureka Springs caramel apples) is "that's another Arkansas Razerback FIRST DOWN!" again and again and again. Hope my Tigers represent better today! Your pictures are all adorable! I am not a football fan but did so much enjoy the video wth you and little Miss Harper, She is going to get so much pleasure from seeing and hearing all that goes on in her life as she gets older, You are such a good mama !!! You know I'm a BAMA fan... so I will say.... GOOOO RAZORBACKS!!! Any team playing Auburn is who I cheer for!!! I am pulling for your team today!!! I am Bulldog fan myself, but I remember that Ark/UT game. I taught the kid who was kicking for UT. He was not one of my favorite students, and I kept hoping he would miss a field goal. What a cutie, you are! Love your darling blog and precious baby. I'm a West Texas high school football coaches wife. Coaching for us, has become a ministry. My husband motivates, leads and loves the kids, coaches and community....and I the wives! I treat them like family. God is making a big difference in our corner of the world! Blessings and blue skies to you and those you love!. That video was too cute! Brody laughed at it...I think he thinks you are funny, or either he saw Harper and it made him laugh! Haha! I wore purple last night, too! :) Yay OBU! We were just in Fayetteville this week. I have never been, but loved going around canpus and shopping at Hog Heaven!! I really did think about you and Harper while I was there! Unfortunatly we were there for my cousins funeral. She was the 10 year old precious girl that was killed last Saturday. She was hit by a car on Razorback road. Please say an extra prayer for my aunt, uncle, and cousins. They are very strong and full of faith, but this is so tough. I was at that game in Austin in 2003...on the other side of the stadium, cheering for Texas. What I remember most is the Arkansas crowd starting a cheer when there was a player hurt on the field and us sitting there thinking it was the tackiest thing we'd ever seen, but I'm sure that wasn't y'all. :) You aren't kidding that it was HOT that day. Miserable. I think they had quite a few people end up needing medical treatment for heat exhaustion. I love the video and your cute accent! It will be so exciting to hear Harper speak one day. I was at the Tennessee/Arkansas game in 2002...it was my senior year. That game lasted forever but was such a good game. I have several good friends who went to Arkansas so the rivalry between us is strong. Love your blog and your personality! Congrats to you and your family, Kelly. The Razorbacks played great! It hurts to lose, but the Razorbacks deserve all the credit for playing a super game. I called the Pigs for ya today. :) I am happy for both our teams but I know Scott isn't proud of my team won. lol!! Come back and visit Tn. and Neyland anytime you want! Cute cute!! I have the perfect post for this!! I'm a BYU fan myself, my hubby and I went to sooo many games in college! Can't wait to dress our baby up in gear one day like I dress my doggie up! Don't think I'm weird for this but...My hubby and I had season tickets for several years and I think they were a couple rows in front of yours. I've been thinking that you and Hillary both looked familiar (I'm pretty good remembering faces) and when you said that yours seats are near each other, that confirmed where I had seen you before. We had to give up our season tickets last year when I decided to stay home with our little girl instead of working. I do miss our tickets but Ashlen is worth the sacrifice. Thank you for the Hog tutorial. I will be practicing my hog calling when I know your team is playing. Cute game day pictures of you and Scott. I know you will be glad when Harper joins in. Have a great weekend with your family. We beat em girl! Your video did me proud!!!! Loved it... super cute!!!!!! I am cracking up at the video....so cute!!! YAY for the Hog win today! Great pics & Fabulous Spirit! And why does everyone talk about your accent? You hardly have one! I'm a Razorback from waaaaayyyy back. Lived in Fayetteville as a little girl and one of my teen-aged babysitters lived near campus. She parked cars in her yard on game days and I would go hang out and watch all the students dressed up for the game. I couldn't wait until I could be one. Fast forward 10 years and I was that student! It was the late 70's and tickets were a nightmare to come by...standing in line & lotteries for limited spaces. Even though we live in Iowa we faithfully watch our hogs...all by ourselves. Tailgate for 2 is not nearly as exciting as being there. Daughter has Arkansas on her short list of universities for next year! Go HOGS!!!! Just had to tell you, I made cake balls tonight and they look great! White cake, rainbow chip icing (yum!) and dipped in chocolate ganache. Hope they'll go over great at the work lunch party tomorrow. Thanks for what I hope will be my new go-to party recipe! You & Harpers are soooo cute... such a fun momma!!! I was at the 6 overtime game at Neyland, too! I think that's probably the most depressed I've ever been in my entire life. We were supposed to stay in Knoxville another night, but we were so upset that we just left the stadium and drove right back to Fayetteville! K- so I was watching your little tutorial on how to do the Hog call when my husband walked in to the room. He asked what I was watching so I started it over for him to see. He has been walking around all weekend randomly doing the Hogs call. I can't stop laughing when he does it. And he doesn't even watch football- he would rather play sports than watch them. Anyways, thank you for being you! Love your blog! I love all your pictures and so love the videos. You girls are just too cute!! So - my daughter (just turned 6) wanted to watch the video of you calling the hogs with Harper! And now - she wants to watch it over and over. You are a star in her mind - LOL!! We were at the USC-Arkansas game, cheering for USC though, and had some crazy Arkansas fans in front of us going that pig cheer the whole time. They were hilarious and so nice though!